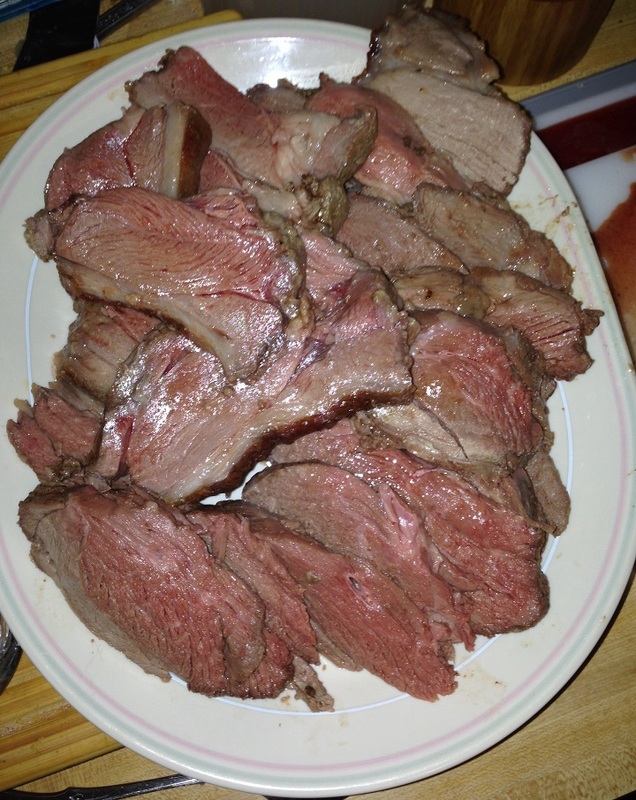 I have had a boneless leg of lamb in the freezer for a few weeks now and we had been waiting for just the right occasion to make it, but it was a pretty large roast so I had to wait until we were having some people over to share it with. It was over five pounds and I had bought it at a really great sale price so it was going to make a nice, elegant meal. For me, one of the best things with lamb is just some simple roasted potatoes and asparagus, which is what I decided to make that day, so I adapted this recipe from Michael Symon for roasted leg of lamb with potatoes. I had to alter it a bit to fit my particular needs since the recipe is for a 6-pound leg of lamb with the bone in, but I really wanted it more for the marinade than anything else. I just adjusted the spices down a little bit, but here is the original recipe that I used as a basis. For the Leg of Lamb: Mix together in a medium bowl the shallots, garlic, rosemary, oregano, sugar, coriander, red pepper flakes, and salt. Rub the mixture all over the surface of the lamb. Place the lamb in a large baking dish, cover it with plastic wrap, and refrigerate it overnight. Remove the lamb from the baking dish, rinse off the seasonings, and pat dry. Let the lamb sit a room temperature for 1 hour. Preheat the oven to 375 degrees. Heat a roasting pan or large ovenproof skillet over medium heat. Add the lamb and brown the lamb on all sides, about 7 to 10 minutes.Transfer the lamb, fat side up, to a roasting rack set into a roasting pan. If you have extra rosemary lay the sprigs over the lamb with a drizzle of olive oil over the top. Roast the lamb until the lamb reaches an internal temperature of about 140 degrees, about 1 1/2 hours. Remove the lamb from the pan and set it aside on a cutting board loosely tented with aluminum foil to rest for 20 minutes before slicing. For the Potatoes: Position a rack in the top third and 1 rack in bottom third of the oven and preheat the oven to 375 degrees. Spray 2 large rimmed baking sheets with nonstick spray. Toss the potatoes with 1/2 cup of the olive oil in a large bowl. Sprinkle the potatoes generously with salt and freshly ground black pepper. Spread the potatoes in a single layer on the baking sheets, dividing the potatoes equally among the two pans. Roast the potatoes for 30 minutes. Meanwhile, whisk extra-virgin olive oil, lemon juice, dill, and lemon peel in small bowl to blend for dressing for the potatoes. Reverse the baking sheets in the oven and toss the potatoes and continue to roast them until the potatoes are tender and brown around the edges, about 15 minutes longer. Toss the roasted potatoes in a large bowl with enough of the remaining dressing to coat them and serve. For the Tzatziki Sauce: Put the yogurt in a paper towel-lined or cheesecloth-lined strainer and set it over a bowl and let the yogurt drain for 24 hours in the refrigerator. Peel and dice the cucumber, sprinkle it with salt and place the cucumbers in a strainer at room temperature for 2 to 3 hours to drain. Stir together the yogurt, cucumber, lemon juice and zest, mint, garlic, and shallot in a medium bowl until the mixture is thoroughly combined. Season to taste with salt and pepper. Naturally, you can roast the potatoes and the lamb together in the oven at the same time or even together in the same roasting pan to save yourself some space. When you take the lamb out to rest, you can then dress the potatoes and continue roasting them until they are roasted the way you like them. The Tzatziki sauce really goes well with the lamb and seems to blend nicely with everything. Don’t worry if your lamb is still pink inside when you roast it to 140 degrees; it really is at its best when it is medium-rare and has the best flavor. Overcooked lamb can be pretty tough and chewy, so this is one of those meals you want to keep an eye for temperature. It takes some prep work ahead of time, but the seasoning for the lamb is great and adds fantastic flavor and crust to the lamb. It is always a family favorite for us and something we don’t have too often, but ut is worth the effort to put in to make it once in a while. That title is seriously cracking me up! And the lamb sounds great! I’m glad you liked it 🙂 The lamb was pretty darn tasty too! Yet another great post. I love lamb, I think it is one of the most underrated kinds of meats. There is so much flavor and so many things you can you can do with it. Thanks for sharing. Thanks! We love it too and you can do so much with it to add all kinds of great flavor. Thanks for the comment!